Why not? We’ve got Doctors Without Borders, Clowns Without Borders, Teachers Without Borders, Engineers Without Borders, and Reporters Without Borders. Kudos, Mr. Tabarrok. Well said. 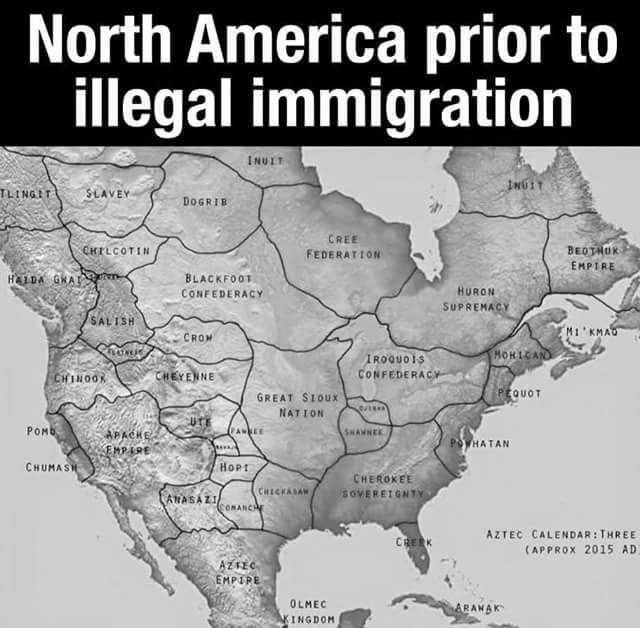 And while we’re on the topic of immigration here’s a map of North America before all the illegal immigrants began pouring in (courtesy of Steve F, whose timing was perfect). I’m still trying to figure out how this works. I mean the part where descendants of some European immigrants on the north side of a river demand that descendants of other European immigrants on the south side stay on the south side of the river. And what makes it especially puzzling is that the northern group was gifted with a statue of Liberty Enlightening the World.